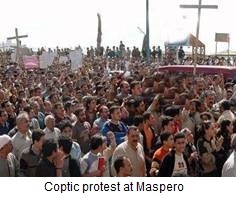 (AINA) -- The Muslim attack on March 5 on a church in the village of Soul, in Atfih, on the outskirts of Cairo, prompted nearly 2,000,000 angry Copts and liberal Muslims to stage a sit-in in front of the TV Building in Maspero for 9 days, demanding the return of the church from the Muslim occupiers and the return of the Copts back to their village. To pacify the Copts and criticisms from foreign governments, the Egyptian army said it would rebuild the church at its own expense. Village Muslims were adamant that if Copts wanted their church, it had to be built outside the village. Army officials and the Governor of Helwan met with Father Balamon, pastor of the torched church, who expected the church to be returned to Copts, but after the meeting Father Balamon said "instead we found the meeting centered around the idea of Copts choosing another location for their church." This suggestion was refused by all Coptic leaders and those at the sit-in, which has now been dubbed the "March 6 Coptic Revolution." Coptic activist Mark Ebeid said "this suggestion was out of the question, and it was made as a test case to see the Coptic reaction. Had we accepted it, we would have faced the prospect of all our churches taken by Muslims and other ones replaced outside the villages like outcasts." The torching of the church was invoked by an illicit relationship between a Coptic married man and a Muslim married woman. The church in Soul and Muslim village elders decided the Coptic man should leave the villager with his family, which he did. The story developed between the father of the Muslim woman and her cousin who wanted the family honour to be restored by killing her. Her father refused and both killed each other. The Muslims, holding the Christians responsible for their misfortune, came back from the funeral straight to the church and torched it. To justify their act, the village Muslims circulated a rumor that the church practices sorcery, based on books with strange designs they found, besides pieces of papers at the alter with Muslim names scribbled on them, wine bottles and some women's clothes. A group of Muslim scholars, headed by the Salafi Shaikh Mohammad Hassan went to the village of Soul and met with the Muslim youth, most of whom are Salafis, in order to pacify them and get them to evacuate the church. Salafis believe in a strict and fundamentalist interpretation of Islam. They agreed to give Hassan 48 hours to consult Sharia Law and other Muslim scholars whether it is possible according to Sharia to rebuild a church or not. "All this taking place while the mighty army is waiting, along with thousands of Copts at the sit-in, to fulfill its promise to rebuild the Soul church," commented activist Wagih Yacoub. "What everyone could not understand was the behavior of the army, as to why they were not forcing the Muslims who occupied the church to evacuate it, as they do with the Copts." Hassan went out on national TV channels confirming that he saw "with his own eyes" what the villagers were saying about the church's witchcraft practice. A couple of priests had to appear on TV to explain that the wine is for celebrating holy communion, the books they saw were not witchcraft formulas, but liturgy books in the Coptic language which uses a Greek alphabet, the scraps of paper with names on the alter belonged to Muslims asking for the intercession of the Virgin Mary whom they revere and the clothes are donations for the poor. On Saturday March 12, after the elapse of 48 hours, Shaikh Hassan went into the overcrowded hall, sitting at a table with a Muslim Brotherhood and an army representative, among other Muslim scholars. He told his audience that he consulted with ten other Sharia scholars, the names of whom he read out, and they all agreed that "According to the general rules of Allah's Sharia and the Fatwa (religious edict) of the scholars, the Armed Forces Supreme Council decided to rebuild the church as it was before, without any decrease or increase in its size, under the supervision of the armed forces engineering department." The representative of the Armed Forces Supreme Council said "In response to the tolerance shown by the village youth towards the rebuilding of the church, the Armed Forces Supreme Council shows its appreciation of the stance of the village youth, and decides to rebuild the church at its own expense, by its executive department, on the same area and to take the same look, with no decrease or increase, starting on Sunday 13 March" (video of conference in Arabic). Hassan added the Copts should return home and the village Muslims who always "protected them" will continue to do so. 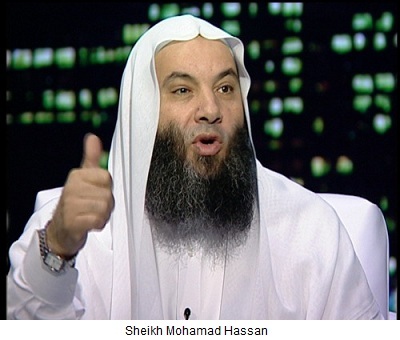 "Hassan wants to make Dhimmis out of us," said Mark Ebeid, "and besides, who said that Muslims protect Christians? I thought we were living in country with a constitution and a police force and not in Mecca or Medina, 14 centuries ago. Or maybe this is a first step to later subject Christians to Jizya for protection." Coptic activist Wagih Yacoub, enraged by the army having recourse to a Salafi Fatwa to give over 15,000,000 Christian in Egypt their rights, said "In this way the Supreme Council gave up in advance the rule of law which it represents, in favor of Sharia law, which is represented by the Muslim Brotherhood and the Salafis." On March 5, Muslims in the village torched the church of St. Mena and St. George after looting its contents (AINA 3-5-2011), playing football with the saints' relics and burning what was left. Afterwards nearly 4000 men demolished the walls of the church with sledgehammers to the sounds of "Allahu Akbar" coming out from the speakers of the nearby mosque (video). Seven thousand Copts fled the village after being terrorized by Muslims, and those who remained were mostly men after women were threatened to be raped, were given refuge by Muslim neighbours or hid in their homes (video). Copts of all ages, including priests and monks, gathered the next day and staged an open sit-in in front of the TV building until they get back "their church" and the return of the displaced Copts back to their homes in Soul village (AINA 3-8-2011). After torching and demolishing the church, Muslims occupied it and vowed to turn it into a Mosque and started collecting donations. They also started praying there.